Halloween Jen Vixen for BlueBlood.com #blueblood #halloween #gothic #tattoogirl #tattoos No, auto correct, I mean Vixen and not Vicente or Biden. Who doesn't know the word vixen? (1) The holiday as really celebrated today started in the Americas. (2) Use of the shamrock was added nearly a thousand years after the death of the saint, as a co-option of Pagan ritual. (3) Leprechauns became associated with the holiday largely due to the release of a 1950's Disney movie about them. (4) Pubs in Ireland were required to be closed on the religious holiday until the 1970's. (5) The original color associated with the holiday was blue. Full series of the lovely Ms. Poisoness on Gothic Sluts and the Blue Blood VIP. Happy St. Patrick's Day! The really big news is that a book of Forrest Black and Amelia G's deathrock portraiture is going to be published. There are four days left in the Kickstarter pledge period and the project has already succeeded and will definitely be funded. Pledge now and Amazon won't charge for the California Deathrock book until the pledge period is complete. Forrest and Amelia will also thank you in print in the book, if you pledge now. Please note that, once the book is published, it should be available via Amazon and Barnes & Noble, but the retail price is expected to be significantly higher than the Kickstarter price. Cool people who Forrest and Amelia have photographed will probably be able to get the book for wholesale pricing later, but that will be around the Kickstarter amount and without the mention in the book dedication. And it would be ever so helpful and awesome if you could get those pledges in now to make sure the book is a hardcover and has the best possible art book paper and most possible pages. You can see some behind-the-scenes footage of what a nightlife portraiture shoot with Amelia G and Forrest Black looks like. Gothic.net is continuing its series of features with a Panel of Experts interviewed on various horror and gothic-related topics. Blue Blood notables on the Panel include Amelia G, John Shirley, Will Judy, Forrest Black, Cecilia Tan, Thomas S. Roche, Ed Mironiuk, Eric Swartz, and Chad Savage. Gothic.net has launched a sister site for dark fashion. Blue Blood sites and talent have been nominated for a gajillion honors in the APN Awards. Blue Blood is still posting news weekly to the contributors blog and Twitter for up-to-the-minute goodness. Gothic.net is seeking a new fiction editor. Gothic.net comes from a strong literary tradition, so the fiction editor will need to have exacting standards. The Gothic.net site receives more visitors every month than any other literary genre site on the net. Writers Gothic.net has published in the past include David J. Schow, Thomas S. Roche, Clint Catalyst, Maria Alexander, Poppy Z. Brite, Richard Matheson, Ramsey Campbell, and many more luminaries of the dark writing world. Fiction editor will initially be responsible for reading all writing submissions and doing coverage on submitted fiction pieces. Fiction editor will then be responsible for contracting and copy-editing final selections and reporting a schedule for writer payouts. Must be proficient in Microsoft Word. WordPress, Excel, and Photoshop skills a plus. Ability to do writer outreach a plus. Please only apply if you are well-versed in literary horror and enjoy the genre. Honorarium pay will be quarterly and more beer money than absinthe money. You will, however, have the ability to put authors in front of a very large readership. Your good taste could break new authors and expose established authors to important audiences. The idea is to provide a sense of both your qualifications and your taste. The event is 18+ (not 21+), which means you only have to be eighteen-years-old to attend. One of the reasons for holding the party at this venue is that they are extra-cool about this. Blue Blood’s Forrest Black and Amelia G will be doing a digital gallery show. The artwork projected on the walls will be portraiture of many denizens of the dark and fabulous, some of whom will be in attendance. BOOM! Studios has given us a ton of great books giveaways. There is stuff from a number of their darker lines, including the 28 Days Later series, the Cthulu Tales series, Disney’s Alice in Wonderland, and . . . [drum roll please!] issue #1 of the new Clive Barker Hellraiser comic. That’s right! Clive Barker is doing a new Hellraiser story in comic book form. There are multiple cover designs, one with art by Clive Barker, one with work by Tim Bradstreet, and one by Nick Percival. 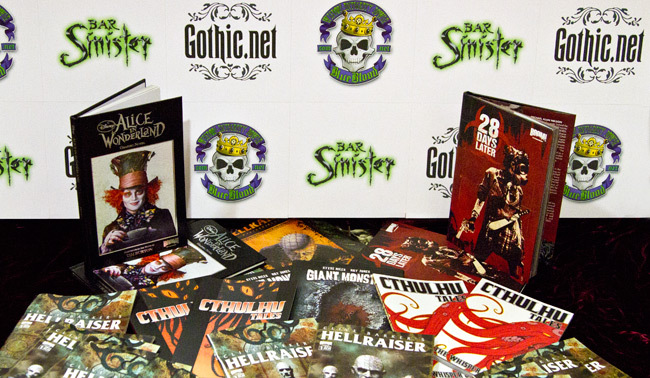 The Hellraiser comic books are not available in stores until Wednesday, but a couple dozen lucky Gothic.net VIPs are going to get a copy of issue number one at the Gothic.net party. Clive Barker + Hellraiser + issue #1 = a very cool collectible . . .
You have no doubt noticed the spiffy new design on Gothic.net, so come on out this Saturday, March 19, and help us celebrate. In Gothic.net’s fifteen years, this is probably the sixth or seventh site design. Mixing things up is good. Here at Gothic.net, we pride ourselves on our combination of horrific literary tradition and bad attitude, but that doesn’t mean we don’t like to come out at night sometimes! The Gothic.net new site design launch party is hosted by Tricia LaBelle and Bar Sinister at Boardners. Boardners is at 1652 Cherokee Ave, just off Hollywood Boulevard in the heart of Hollywood. Boardners is a seventy-year-old historic Hollywood venue. It is rumored to be the last stop for Elizabeth Short, where she drank before her ghoulish murder gave her immortality as the Black Dahlia. At one time, Boardners appeared to be a beauty parlor, but this was really just a front for its true calling as a gambling speakeasy. What a perfect place to celebrate the dark! After the event, Gothic.net will be publishing photos from the Gothic.net party red carpet. Red carpet arrivals are from 10pm to 11pm. Gothic.net contributors, including fiction writers, artists, and members of the Gothic.net panel of experts, should contact us for guest list. Community members with more than 1,000 posts (who have not been Eyeball SPORKED!) qualify for VIP as well. Blue Blood’s Amelia G and Forrest Black will also be covering the party for magazines and online, with a portrait photo location towards the back door of the nightclub. There will also be performances from two gothic bands on stage, The Tragic Tantrum and Mather Louth And Radio Noir, with DJ John C & DJ Tommy spinning in between and after. You can use the flyer below for a discount, on . . .